And, You Can Achieve This Larger Appearance Without the Heavy Construction or Demolition! When planning a bathroom remodel, what is one thing that many people want the most? For their new bathroom to appear a little larger and more open because let's face it, larger bathrooms look luxurious, and they draw in prospective buyers for those who plan to sell in the future. If you would like for your bathroom to appear larger, you're in luck because there are a few tips and tricks that will help make your bathroom 'appear' larger without the heavy construction or demolition required. You will find some of these tips and tricks below. When you're ready to get started on your bathroom remodel, give our qualified team members at Creative Bath Systems a call! 1. Bathroom Mirrors Go a Long Way! When you opt to use more than one bathroom mirror, you can give the illusion of having more space. For example, putting a mirror on the longest wall in the bathroom will make the room itself appear wider. Another example would be putting two bathroom mirrors positioned directly across from each other as this can make the bathroom seem never-ending. Keep in mind that this unique trick works well for windows too. If you place a mirror directly across from a window, it'll give the illusion that you have two windows. 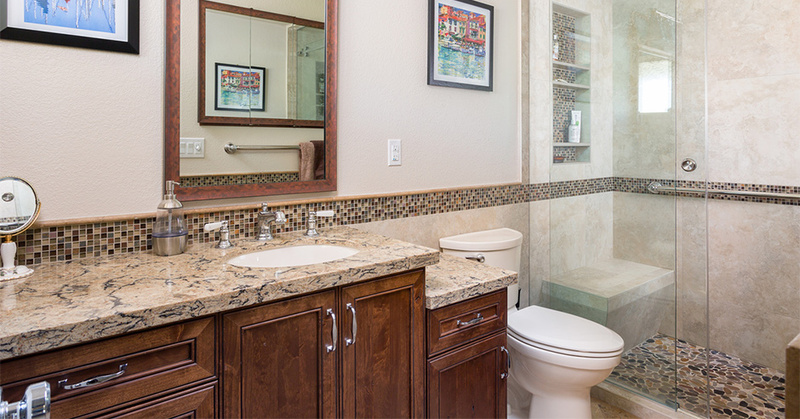 Bathrooms with larger cabinets can weigh down the room, especially in smaller bathrooms. You can lighten things up with a furniture-style vanity without cabinet doors and drawers. Try and find one that has shelving underneath to ensure that you still have plenty of storage space. Purchase several wicker baskets and place them along the shelf to organize your toiletries and cosmetics. When you increase the light in a room, it'll naturally make it feel bigger and more open. To brighten up dark corners, install recessed lighting. If recessed lighting doesn't fit in your budget, don't stress! Wall sconces make an excellent alternative to brightening up any space! These look especially pleasing on either side of the vanity mirror. Nothing opens up your bathroom like a pedestal sink. When homeowners choose a traditional vanity, they might not realize how it can close in a bath and make it feel overcrowded. Since a pedestal sink cuts down on storage, you might want to consider installing a medicine cabinet above the vanity in order to increase space and storage. The obvious goal is to create the illusion of more space, and a straightforward fix is to replace your shower curtains with shower doors. With this, you'll visually create more space since you'll be able to see straight through the shower door. We understand that for some homeowners, shower doors might not fit into the budget, if that's the case, don't worry! You can recreate this look with a clear shower curtain! Just be sure to keep both your shower and shower curtains clean to maximize the light getting through and magnify the illusion of space. If you're short on storage, carving out additional space by creating a recessed shelf in a wall might be a good option for you! Recessed shelves look modern and, they don't take up precious space along the floor. Fun tip: you can create the illusion of even more space by painting the inside of the shelves a darker shade than the wall color!